The people who manufacture razor blade refill cartridges have quite literally got us by the short and curly; with expensive replacement cartridges and incompatible fittings, its enough to make you quit shaving and grow a beard. The problem is, when you give up on disposable razor blades and opt for a handle and cartridge system, youre stuck with buying replacement cartridges for that particular handle. That might sound straight forward, but when they have a range of similar products it can get quite confusing and mistakes are easy to make. To give you an example, I have a Gillette Mach 3 razor handle which I have been using quite happily for some time. However, the other day I decided it was time to pick up another replacement pack of blades. 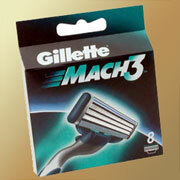 I went to the supermarket and unfortunately was in a bit of a hurry so I picked up the Gillette Sensor 3 blades instead of the Mach 3 ones. Im willing to bet others have done the same the packaging and branding is very similar. I didnt spot the difference until the next morning when I went to use them, but I figured theyre all Gillette so they should fit. Well how wrong was that assumption, of course they didnt, not even close. I wouldnt mind, but I had an uncomfortable shave that morning and Ive now got a pack of blades that I cant use as I am not about to go buy yet another handle. You can get cheaper unbranded replacement cartridges for some shaving systems, but quite often the little diagram on the back of the pack which shows how they clip on is often difficult to discern. Why cant they just make all razors and handles with the same fitting? One would presume that this is so that you are forced to buy your replacement blades from THEM and no one else. Totally agree,miles overpriced is a fix. We're a shaving company called Dorco, and we think everyone should be able to afford high quality razors. Check out our prices and read our customer reviews for yourself at DorcoUSA.com. Don't be a victim of the Great Shaving Ripoff any longer, and Demand More for Less! Chickens are all small in shopping malls all over town, I know they are for poor people, but normal men need a bigger bird to feed his fambly at thanksgiving. And Rolls razors, they are good stuff indeed. Not too small. Consider this con. In Boots to day I saw bottles of mineral water of size 100 ml on sale on the pharmacy counter for 60p. What a rip-off! I thought chemists were supposed to supply a glass of water for free if you need one to take your pills. I agree MMG but I must own up to finding his/hers spellings amusing. As I've suggested in earlier posts on different threads, the entrance of Jobby (and his many pseudonyms) onto The Weekly Gripe, has been met with disaster in terms of significantly lowering the quality of debate. Jobby is poisonous to this forum and I ask him to go elsewhere. Unfortunately, I doubt that he will agree to such a request. In the meantime, best not to pander to his crazy, inflated sense of ego. Jobby Jobster is not a well boy, I think. The kindest thing is just to ignore him and leave him to his sad obsessive behaviour patterns. Better to not reply or comment, don't even mark him up or down. It would be better for him if he sought help but I don't suppose he will. jobby ........ does your fantasy world have a name? I can suggest a few if not. My razor takes multi fit swivel head twin blades that I used to buy from Wilkinsons but in their infinate wisdom or greed they have vanished from the shelves to be replaced with far more expensive brands, I have come to the conclusion that if you find a product that you like you have to buy dozens of them before they get withdrawn from sale. What I want to know is if replacement razor blades - just a few thin slices of sharpened steel - are now so expensive that many shops keep them locked up in little cabinets, how is any country able to afford batleships? Who's kidding whom? Jack Hutchison Author of ebook Gypsy's Don't Cry. Another irritating failing I must add about modern cartridge razors is that they are extremely hard to clean because the blades are fixed too close to the razor. And that creates a problem because the blade gets clogged before you can complete your shave. So...you bin it...and pull another one out of its plastic bag. So come on all you potential Alan Sugars, Richard Bransons and Simon Cowell's.......? Jack Hutchison Author of Ebook Gypsies Don't Cry. Yes. Thanks for that tip Boblet. I haven't looked for a second hand one to use but I'm sure you're right there are thousands about, like old Singer sewing machines Problem is I don't fancy using a second hand razor. I have a rolls razor knocking about somewhere mine is in an aluminium case you could by them in brass, very posh. Go to your local antique market Jack you will pick one up for a few quid.